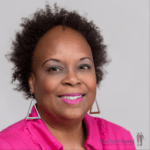 Celebrating and Elevating Black Women - mind, body, soul and spirit! Akasha is today’s featured Swirler. 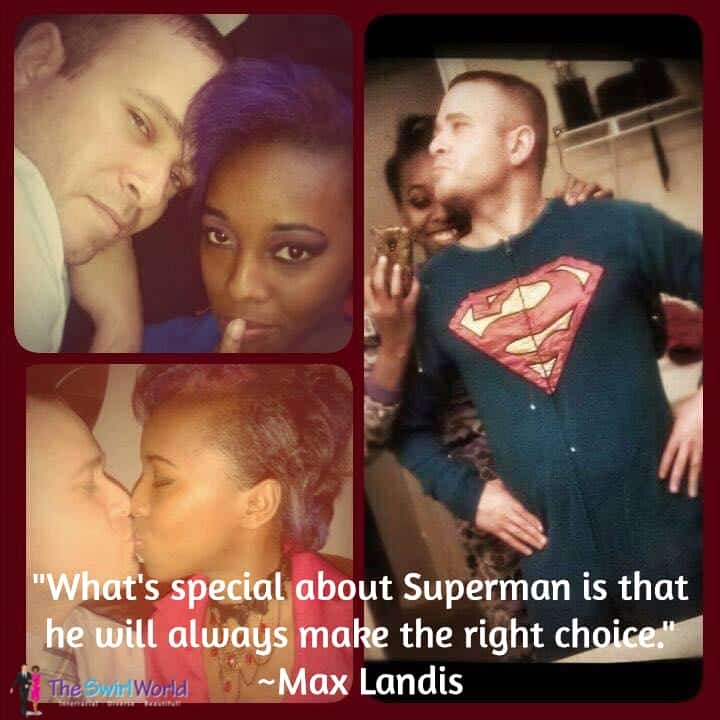 The Superman in Akasha’s life is obviously happy he made her his choice. Smart guy, that Superman . . . . The Swirl World Team is committed to sharing 365 days of inspiration in 2015. Our goal is to help you stay motivated and inspired by bringing you positive, uplifting images and corresponding thoughts. We’d love to FEATURE YOU in one of our Inspiration Daily posts! If you’d like to be featured, please send a nice, clear photo to InspirationDaily@TheSwirlWorld.com. Copyright ©2015 Michelle Matthews Calloway, ASwirlGirl™, The Swirl World™, The Swirl World Podcast™, The Swirl World Inspiration Daily™, Swirl Nation™, All rights reserved. Photo used with permission. My Mom and Dad do a great job of keeping up with the progress I’m making (or not) on my dissertation. Last week I was a bit bummed out about the edits I learned I’d have to make after hearing back from the Quality Reviewers. I got past it, squared my shoulders, and determined that I would Keep Calm And Write On. Of course the size of eraser brought a smile to my face. Even so, I know my Mother well enough to know that: (a) She wasn’t trying to make a joke, and (b) because she knows me so well, she knew I needed it and would use it. (I usually write before I type, and as a result I’ve amassed a vast collection of mechanical pencils). I erase. Often. 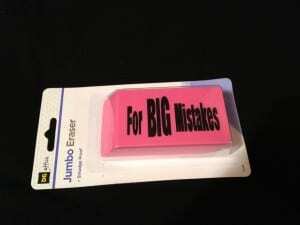 The writing on the eraser proudly proclaims: “For BIG Mistakes.” I thought about those words, what an eraser does, and wished the Dollar General made one that could be used on life’s big mistakes. Have you ever done something you wished you could undo? Made a decision to go right – when you should have gone left? Walked away when you should have stayed? Spoken some words that would have been better left unsaid? Unfortunately, neither life nor the Dollar General comes with an eraser For BIG Mistakes. We have always been told that we should learn from our mistakes, and that’s certainly true enough. 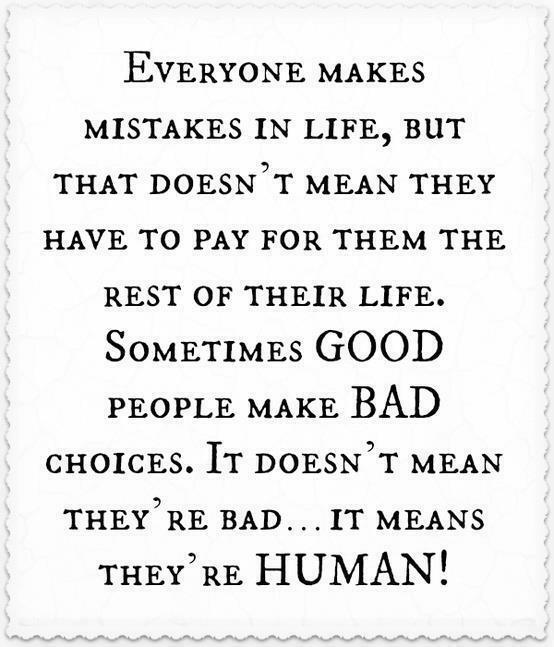 Mistakes don’t have to be self-made for us to learn from them; shucks, we can look at the mistakes of others and take a lesson if we choose to pay attention. Sometimes the cure for a BIG mistake comes when we start over. We take the eraser and start swiping. The relief and the release come when we erase. We let go; choose to forgive ourselves if the mistake was ours, or forgive someone if the mistake was theirs. Erase; erase. We accept the concept of imperfection: Screw ups, blunders, lapses in judgment, missteps, major disasters. I believe the cure for BIG mistakes comes when we dust off, regroup, recover and keep moving forward. Sadder? Maybe. Wiser? Definitely! Yet, we move forward: Onward and up to the next step. We put one foot in front of the other; physically and emotionally. Soon, we discover that we have progressed; we’ve grown and matured. Ultimately, we see that we are better for the mistake. And that’s when we know the cure is complete. Join in the Fray: When have you had to use a BIG eraser? I’m blogging every day in the month of April for BlogHer’s NaBloPoMo Challenge. Thanks for reading and do leave a comment! Copyright © 2013 Michelle Matthews Calloway, ASwirlGirl™, The Swirl World™, All rights reserved. Join in the Fray: Do “good” people really make “bad” choices? Copyright © 2012 Michelle Matthews Calloway, ASwirlGirl™, All rights reserved. I’m blogging every day in the month of November as a participant in NaBloPoMo. Thanks for reading and feel free to comment! Join The Swirl Nation and Receive Updates Via Email! Provide your email address if you'd like to hear from us from time to time. We promise we won't spam you! Looking for something? Search here! InterracialMatch.com - the best interracial dating site! All rights reserved. All work is the copyright of the respective owner, otherwise copyright ©2015 Michelle Matthews Calloway, ASwirlGirl™, The Swirl World™, The Swirl World Podcast™, The Swirl World Inspiration Daily™, Swirl Nation™, all rights reserved, Dallas, TX, USA. This work is licensed under a Creative Commons Attribution-NoDerivs 3.0 Unported License.